What’s better than recycling? REUSING! When y’all burn your candles and bring us back the empty jars, you get $1 off your next candle and we clean out the jars and use them again! p.s. If you live in Austin, the best way to get us your empty candle jars is to bring them to our store! Well, oops. It's been more than THREE years since we (I) have written a blog post. Moved our shop one block over to a bigger and better space! Had another baby! Hi Fletcher Walter! (born April 12 2017). He and Josiah share a birthday - 28 years apart! Now have our candles in over 450 stores - including ANTHROPOLOGIE ONLINE gasp. Have a mcandle studio/warehouse space with 2 mostly full-time employees! not taking pictures in the delivery room. Greta Rosemary is HERE! She was born on March 5. It's been a crazy couple of weeks adjusting to life with a newborn. She's fantastic - - and also a little exhausting! Josiah and I decided to NOT take pictures in the delivery room - or even for the first 12 hours! And we don't regret it one bit! 1. We got to ENJOY THE MOMENT. (oh no, our first picture of her is when she's already 12 hours old, not 2 minutes. Will we survive?) We just got to look at her, laugh and cry I'm sure (it's kinda all a blur), and be together as a new family of 3. I'm normally pretty "social media obsessed" so it was really nice to slow down for once and not post on facebook/instagram about her being born until the next morning. That first night was really exciting (and I also ate what at the time seemed like the best sandwich of my life) and it was great to put away our phones/camera. 2. No stress on Josiah to take that "perfect picture" of us in the first 10 minutes. I'm the photographer of the family, yet I'm also the one who cares more about having a great photo to share with everyone. If I tried to have Josiah take a photo, I would've gotten super stressed at him about lighting and camera settings and getting it from a good angle. Let's wait until everything's a bit calmer and when I can take them myself, shall we? 3. I don't want/need bloody pictures of her. My mom doesn't have any of me bloody and I'm not all torn up about it. I'd prefer to see Greta all clean and perfect. If you like those bloody/mucusy photos, more power to ya. If Greta wonders later what she looked like when she was born, I'll tell her to google and find some fresh out newborns, and pretend they are her. 4. No crappy iphone photos. No matter how good they make camera phones, photos are always better with a nice regular camera. A lot of the time, phone photos end up dark, blurry, super small, or just all around terrible. Since we waited to take photos, I got to get out my nice camera the next morning when everything was WAY calmer and we had slept a little. Then we had a nice, non-blurry photo of Greta to send to family and friends announcing her arrival. Our favorite reason? The first one - - just being in the moment and forgetting about all social media. And here's our photo we shared with everyone of our little stinker - 12ish hours old! Josiah and I went to the doctor yesterday and found out we're having a girl! And she was doing a perfect "Rosie the Riveter" pose so I figured pairing the two would be the perfect little announcement. 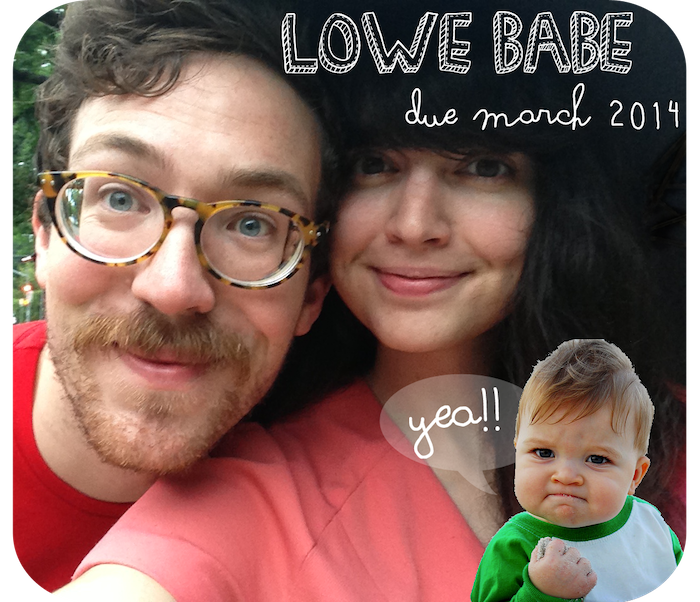 We're so excited! We don't blog about our personal lives too much.... really because we're pretty boring people and we know people would rather just hear cool life hacks and food tips and stuff. BUT.... this is worth sharing... Lauren is pregnant! We are super super excited. And here's the obligatory sonogram photo - and apparently I'm having a teddy bear. So you know what that means.... the next year will probably include blog posts with life hacks that are more baby related (I'm already envisioning making my own baby food, figuring out cloth diapers, etc etc) I promise though - the blog will still be for everyone! It's a surprise as to who is sending you a package, thanks to the mastermind known as Chelsea of Cedar+Pine. Kinda like Secret Santa, but it changes every month? And I'm LOVING IT. 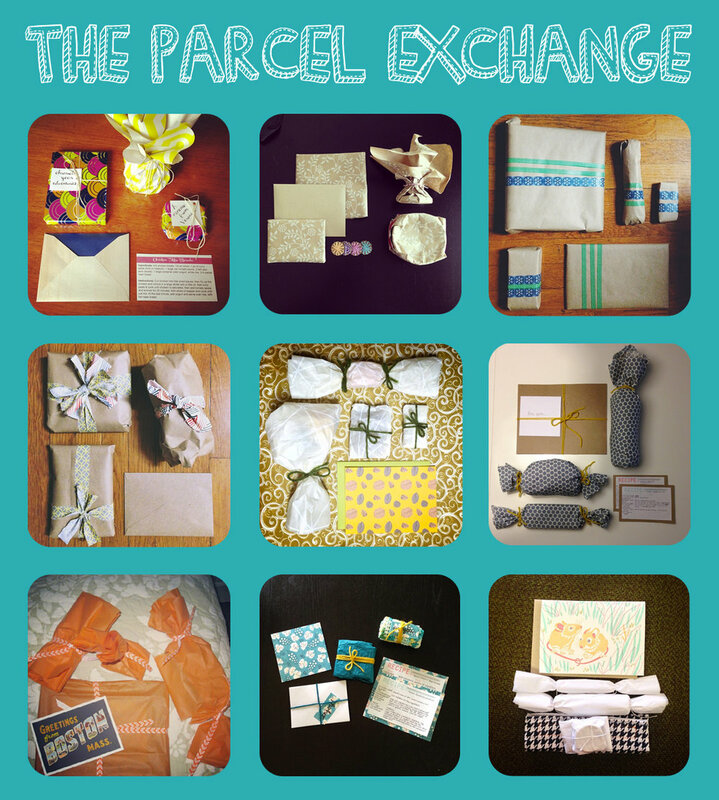 We gather $10ish-$20ish worth of goodies/handmade things/recipes/etc and ship it off on the first of every month. And we've already had SO many people ask us how they can join - my instagram blows up every time I post a picture of goodies I'm sending or receiving! Ours is currently full as we want to get to know each other better, and if it's too massive, it'll be hard to get to know everyone. BUT - - MAKE YOUR OWN PARCEL EXCHANGE GROUP! You know at least ONE person who lives in another city or state, yes? (If no, mmm.... sorry weirdo :) ). Ask them who else they know that lives somewhere else, and then ask that other person who else THEY know, and then that other other person who else THEY know. You'll come up with a list of 3-8 in no time! Then, send each other cute lil packages! It's like Christmas but year round - and it totally doesn't have to break the bank - especially if you're a craft sort of person! Josiah and I have been doing a lot of thinking, and we think its time to rebrand the blog and shop. 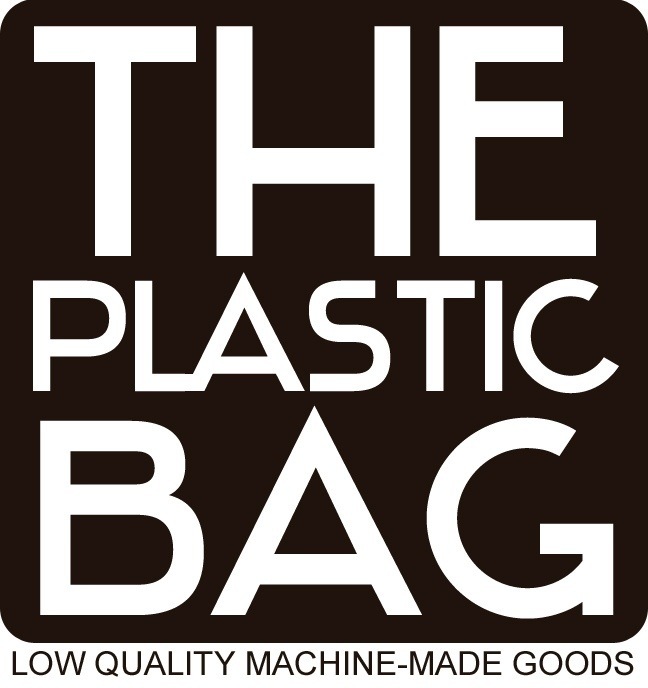 So we are changing from The Burlap Bag - high quality handmade goods to The Plastic Bag - low quality machine-made goods. It just seems like a good fit. A whole shop full of items from China and blog tutorials on microwave dinners and gluing yarn to plastic plates. Give us your thoughts! In other world news, today is the first of April. The Burlap Bag - a video! Our good friend Andy made this sweet video of us and the shop.... in case you were ever wanting a video tour. Andy is an awesome awesome photographer - he and his wife Carrie shoot photos for weddings and family portraits as HappyDayMedia - go check their website out! Or like 'em on facebook. You won't regret it. Ok. Watch ze video. Ze end. Josiah and I have lots to be thankful for - and we want to spread that joy to others. And we encourage you to spread your joy too. We normally aren't super sappy - but we think helping others is awesome. We posted this on facebook today: "2013 SPREAD JOY CHALLENGE: We will pick 5 random people who comment on this status to receive a gift from us sometime in 2013. The only catch is that you must also pay it forward to 5 people via your facebook status. You could give homemade baked goods, a handmade gift, a gift card, or or or...." and we were so excited about peoples' willing responses about spreading happiness to others! So. Join us in what we've called the 2013 Spread Joy Challenge. There's SO many things we can do for those around us - some involve money, some involve just 2 seconds of your time, some are more involved time-wise and financially. Get your friend a random gift - no occasion! Give your waiter/waitress a great big tip! Take some college kids out to dinner. Send someone money/gift cards in the mail ANONYMOUSLY. and endless other ideas! Share ideas in the comments! If you think you're up for the challenge, please join us in "paying it forward" to 5 people. Leave a comment saying you're IN if you like! And please come back and share what you're doing to make some smiles. Met lots of other business owners/managers! SunnieBunnie over at Atown is now a dear friend that we met this year. Lauren was on TV! Had a great interview about shopping local that aired on Thanksgiving. Started guest blogging for Simple Design! Held our own craft fair – with over 1000 people in the shop within 3 days! And most importantly… The Burlap Bag turned ONE!! A huge & exciting moment for us. Hung out lots and lots with friends. A few favorite memories: Snowshoeing in Boise with the Vinson's, seeing Sufjan Stevens in concert with the Salina crowd, hanging on a barge under the 360 bridge, "initiating" Patrick's new game store with the first game, and having many a visit to dog&duck pub. Dyed 10 inches of my hair pink. 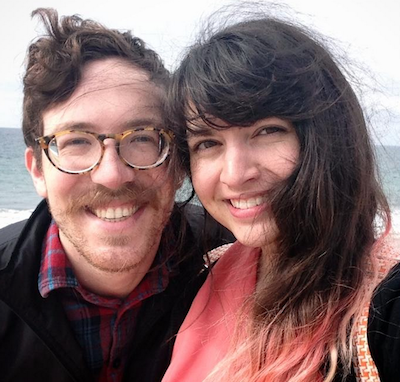 Celebrated being married for FOUR years! 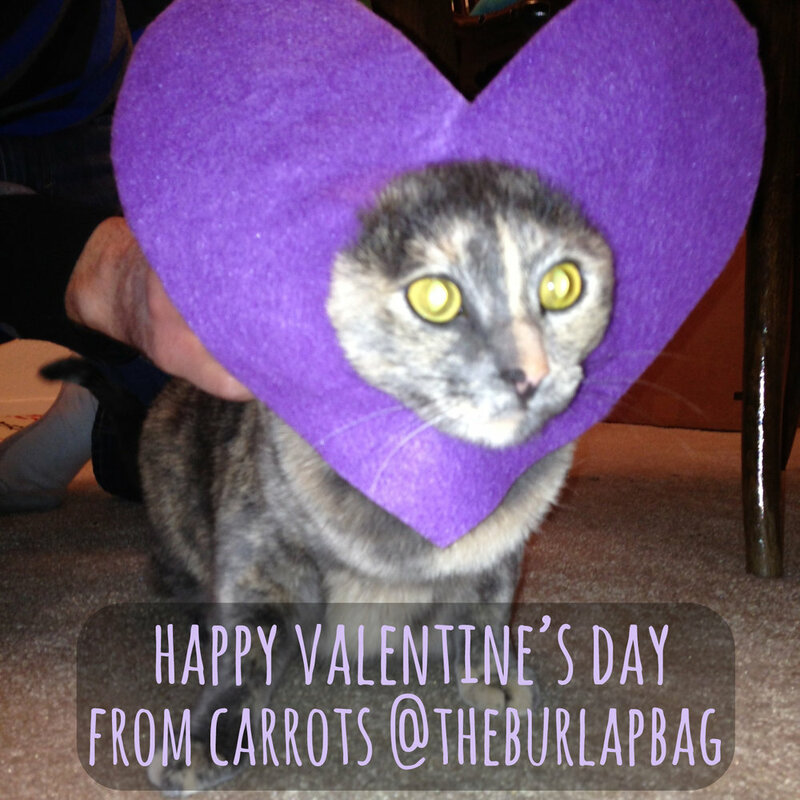 Started an instgram for the kitties (@carrotsandturnip) and they have over 2000 followers. ridiculous. Discovered our Torchy's Tacos obsession. Grew a very fruitful (literally!) garden! 4 massive taller-than-me tomato plants, 3 bell pepper plants that are still producing, and herbs! Hosting more free clothing swaps at the shop! 10,000 instagram followers for the kitties. They need to be famous and ridiculous. Thanks everyone for reading our blog/shopping at our store/supporting us! We’ll try to bring you many more silly posts in 2013. Also last week - I (Lauren) was interviewed on tv! Which is hilarious, because we don't even own a tv. Ha. But it was great. I chatted with the news guy and Rebekka Adams (of the Austin Independent Business Alliance) about shopping at local stores for the holidays instead of the big chain stores. you can watch my (awkward) interview here if you're so inclined. So with Renegade, and being on the news, and of course getting the shop ready for the holidays, you can see why it's been hectic around here! but i'm making time for blogging more this week. ok? ok. So we just took it one day at a time. Living life microwave-free. I don't even really have anything against microwaves, but we really enjoy not having one. It's less clutter of a huge bulky item that we just don't need! But Lauren, what about ___________.... yes, I've got answers. But Lauren, what about tea? It's called a kettle and I love it. We have a lovely blue Le Creuset one. You can have water ready for tea in 4 minutes. But Lauren, what about popcorn? You gotta have microwave popcorn! Nope, I've got a Whirley-Pop and it's incredible! The Whirley Pop cooks popcorn on the stove and it tastes SO much better than microwave popcorn. Also, it's fresh. Also, it's CHEAPER... popcorn kernels are soooo cheap! Also, you get to decide what you want on top (not NEARLY as much butter as that microwave stuff comes with!) Also, it's done in about 3 minutes. Also, your house will smell so good, like the fair! Also, go get one. You won't regret it. But Lauren, what about leftovers? Aren't they so easy to re-heat in the microwave? Not having a microwave does take a little extra time... But we've just learned to get over it. And we love it! Well, there ya have it. We love not having a microwave. I know, we're weird. But maybe just try this week to not use yours as much... and see if you could live without one too! color me rad 5k free registration giveaway!! I've been running. Ugh, no, I'm not naturally a runner. A couple of months ago, I decided I WILL BE A RUNNER. So that's what I did. I ran. Terribly. The first time, I ran .3 miles and had to stop so I wouldn't vomit. But the next day, I did it again. And SLOWLY, it got easier to run. Well, I'm running like a snail. But it counts. Now don't get me wrong. Running still isn't a dream. But it's so much easier than when I started. This morning? Ran 3.5 miles straight. Yes, it took me 45 whole minutes, but I DID IT! That's the most I've ever run! A lot of people use Couchto5k and love it - it trains you safely and slowly for a 5k in 9 weeks. To celebrate my running, I'm doing an amazing run called Color Me Rad 5k. It's full of color, which I absolutely love. You get colored cornstarch thrown on you every 1/2 a mile or so. I will laugh the whole way. And take photos after! It's a huge celebration of being able to even MOVE. The best part of this colorful race? It's being held in Austin ON MY BIRTHDAY! December 8th. Color Me Rad has been awesome and donated TWO free registrations for us to give away!! That means you can join Josiah and I for free if you're in Austin or any close-to-Austin city like Dallas or Houston. Please do join us, even if you don't win a free registration! On the website, you can enter in a team to run with. Our team name is The Burlap Bag. Shocking and original name, I know. If you think you can't run a 5k... just slowly start jogging. Or walking fast. And keep doing it. The race isn't until December so you have more than 3 full months to get ready! Or just come out and walk it! I will running the speed of a snail. And we will all take colorful crazy pictures together afterwards. i. want. to. be. in. that. We have 5 different ways you can enter this giveaway for a free registration to the Color Me Rad 5k. And TWO of you will win a free registration! Please leave a SEPARATE comment for each entry… so if you do all 5, you should leave us 5 comments here! If you leave them all in one comment we will NOT count them as multiple… it gets too crazy with +100 comments! Option 2: Leave a comment on one of our other posts! Then leave a comment here that you commented. Yes, I know, it’s silly. Option 3: Post a pin to pinterest about the giveaway. Or a post on facebook. Or on twitter. Or some other social media! The giveaway officially ends September 6th, 2012 at 1:00pm central time. GIVEAWAY IS CLOSED NOW!!! WE'RE HAVING A PARTY! with drinks. and desserts. LOTS of desserts! AND YOU'RE INVITED! It's our way to say thanks for supporting us (even if just through reading our blog!). And it's our way to celebrate with everyone. And it's our way to eat tons of sugar and have a good excuse. We're having 6 different amazing dessert sponsors. Yes, SIX! Cookies, cupcakes, cake pops, macarons, and more. Provided by: Cookie Crowd, Like Honey Bakery, Sugar N Spice Patisserie, kathyphantastic, Macarons by Jane, & Sugar Plum. I'm already hungry just thinking about it. RSVP via our facebook event page! We would seriously love for all our awesome blog readers to come! This week we have TWO posts up on Simple Mom. Why? Because we're that cool. Errrr not. Just because! First: Easy breakfast kitchen art! We did a simplified and modern version of bacon and eggs. 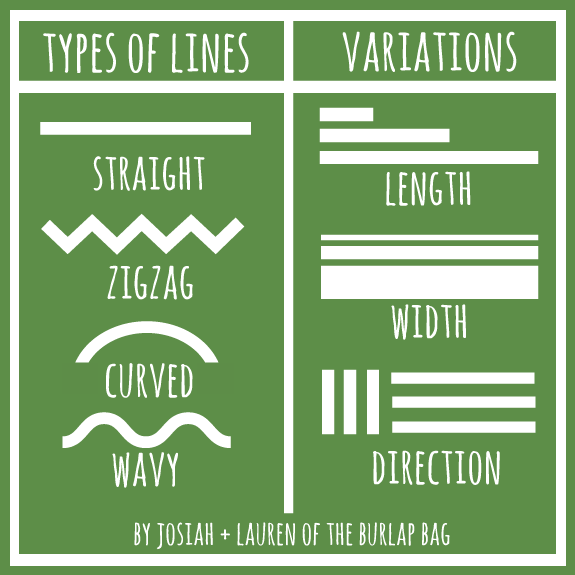 Our final post in the design series is up on Simple Mom - A Lesson in Line And we made this fun little graphic to help explain everything. Go read our article! Our guest series for Simple Mom is still movin' along. We've now had 4 posts, A Lesson in Color, A Lesson in Shape, A Lesson in Texture and now... A Lesson in Size! Ok go read it. Go on. :) And then come back here and peruse. We've been having tons of fun guest writing for Simple Mom. In our mini series, we've had... A Lesson in Color, A Lesson in Shape, and today we posted.... A Lesson in Texture! So head on over to Simple Design and check out our post on A Lesson in Texture - you'll see what different fun textures we found in our life and how you can implement textures into yours! Check back on Monday or Tuesday. We have an amazing 2 ingredient recipe for you. Yes, TWO ingredients! !